Yesterday 5 meters away from my destination my rear derailleur suddenly "snapped". I though at first that the cable broke, but no. I flipped the bike around and started shifting and it looks like it kinda "works" but it suddenly doesn't want to shift into the lowest gear (the biggest gearsprocket). I rode back home just fine, but I am a little bit worried and I am not sure what happened. My questions: Should I go to my local bike shop and ask them what my problem is and get it fixed? Which will probably cost 100€ or more. Should I buy one of these rear derailleurs and try to replace my old one myself? Should I buy a new "groupset" and upgrade to 2x9 or even higher? Should I just simply buy a new bike? The old one has around 10000-15000 km which isn't that much, but I would need to slowly replace the brakes, the front shifter, the crankset and bottom bracket and the cables. I just bought new rims and a cassette. Thanks for the reply! Yeah I was thinking too that this solution might be the best. I googled DAG-tool and yeah that is pretty much the only tool that I don't have (and a couple tools for cutting the frame, and another few for adjusting the bearings and such) and have no idea how to use it (although I googled that too and it looks pretty straight forward, pun intended). If my MTB rear deraileur brakes (for which I already bought a replacement), I will have to buy one and learn how to use it. The simple truth is this. Derailleur hanger's are out fresh out of the box 90%+ of the time. If one is their own wrench on multi speed bicycles you should own this tool. It is a tool that will last for many years and pay for it's self over and over again. The number one mistake that Bicycle mechanics make is setting up the gears on a bike without checking this before proceeding. Only to find out that the shifting is not dialing in proper and quiet as it should be. Then if they end up checking the derailleur alignment to find it needed tweaking. So, the steps they took to set the bike up ended up being 1,3,2 if you will. Take the proper steps off the bat and it will be fine the first time. There are plenty of video's on youtube to show you how to use the Derailleur alignment tool. However none of them explain the pre-checks one needs to do before the final step of actually using the tool. Think of the frame being the "Skeleton" and the ole saying the knee bone is connected to the ankle bone. So, when working on a bicycles system, i.e. drivetrain, brakes, etc...everything from the frame out from the system must be checked and adjusted as needed before setting the outward component. This will ensure a first time set up and Fine tuning of the system. In your case for example it will be the derailleur connected to the hanger, connected the axle, connected to the wheel connected to the cassette.Secondary would be your crank area as this may affect your shifting system setup. So, Pedal to the crank arm, crank arm to the spindle, and spindle to the bearings. Check to make sure this is all tight and right before setting the gears. doing these steps are the true meaning of "Fine tuning". I hope this long winded message understandable. Ha sorry about that. You will see in video's working the dag tool measuring from the stem area on the 4 points, that is fine however if the wheel is trued first and the axle is tight, it does not matter. Industry standard is 4mm on 4 points. I dial it closer to 2mm. Of course if bearings are in need of service, do that also, before proceeding. I hope you understand and this will help you in the future. Keep your steps 1,2,3 by working from the frame out to your task at hand and you will never have an unexpected result in having to back track an issue after a set up. (05-18-2017, 10:30 PM)painkiller Wrote: The simple truth is this. Derailleur hanger's are out fresh out of the box 90%+ of the time. If one is their own wrench on multi speed bicycles you should own this tool. It is a tool that will last for many years and pay for it's self over and over again. The number one mistake that Bicycle mechanics make is setting up the gears on a bike without checking this before proceeding. Only to find out that the shifting is not dialing in proper and quiet as it should be. Then if they end up checking the derailleur alignment to find it needed tweaking. So, the steps they took to set the bike up ended up being 1,3,2 if you will. Take the proper steps off the bat and it will be fine the first time. 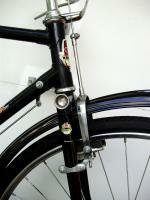 There are plenty of video's on youtube to show you how to use the Derailleur alignment tool. However none of them explain the pre-checks one needs to do before the final step of actually using the tool. Think of the frame being the "Skeleton" and the ole saying the knee bone is connected to the ankle bone. So, when working on a bicycles system, i.e. drivetrain, brakes, etc...everything from the frame out from the system must be checked and adjusted as needed before setting the outward component. This will ensure a first time set up and Fine tuning of the system. In your case for example it will be the derailleur connected to the hanger, connected the axle, connected to the wheel connected to the cassette.Secondary would be your crank area as this may affect your shifting system setup. So, Pedal to the crank arm, crank arm to the spindle, and spindle to the bearings. Check to make sure this is all tight and right before setting the gears. doing these steps are the true meaning of "Fine tuning". I hope this long winded message understandable. Ha sorry about that. You will see in video's working the dag tool measuring from the stem area on the 4 points, that is fine however if the wheel is trued first and the axle is tight, it does not matter. Industry standard is 4mm on 4 points. I dial it closer to 2mm. Of course if bearings are in need of service, do that also, before proceeding. I hope you understand and this will help you in the future. Keep your steps 1,2,3 by working from the frame out to your task at hand and you will never have an unexpected result in having to back track an issue after a set up. I think I understand it quite well. Thank you for the tips, they are invaluable! If I need to buy something for my bike again, I will put a DAG-Tool into the shopping bag. It might take me some time till I have to use it, but it is worth it. Again sorry for the long wind. These are things that a mechanic might check automatically without thinking about it because they do it all the time. Many do not and are substandard. But the message never seems to be conveyed in the video's one might come across on you tube for a particular task or repair. The Dag tool is pricey, but if you figure on shop repair prices vs the cost of the tools quit often it is a money saver to be your own wrench, as long as you can learn the right way. The dag tool is one you could buy right, use and resell like on Ebay as like new used once and recoup nearly 90% of what you paid in the first place. Good luck! you should be fine. Every tool I have ever had to purchase has more than paid for its self 10 fold. That simple!